I raise suri alpacas, and sell both breeding and fiber stock. Suri Alpaca Fiber is available in “raw” (unskirted, unsorted) from, and in partially processed forms (dyed locks, roving, yarns, etc.). I also raise and sell Sebastopol Geese (Wedding Gown Geese, including hatching eggs in season, and breeding stock when available. 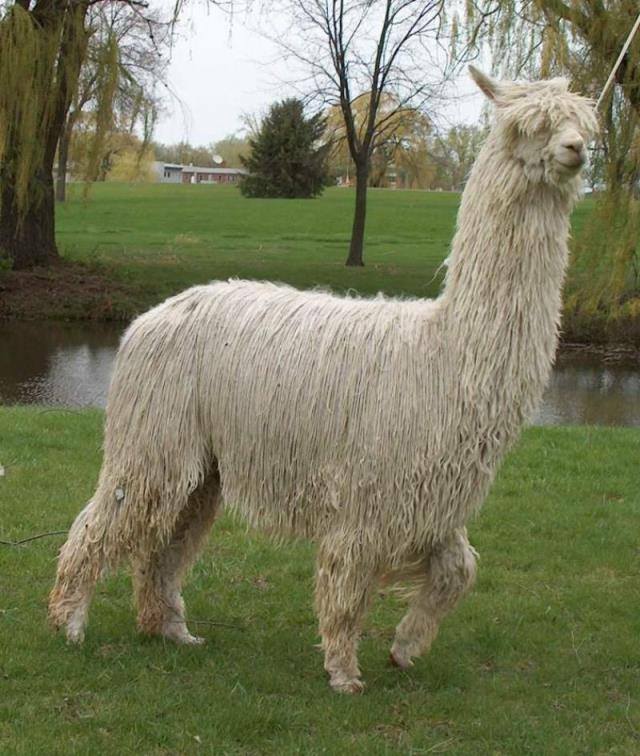 My alpaca herd sires are also available for outside breeding. I carry hand-made and Alpaca Cooperative end products for resale. Alpaca meat is also available on occasion. My farm is sustainably operated under principles of Holistic Management. My animals are cared for solely by me, including annual shearing and most health protocols. I send a large percentage of my annual fiber clip to my Co-op, and have the balance processed into yarn for resale, some by hand spinners and some by small mills. I am willing to do shearing demonstrations during shearing season (May-July, depending on weather and schedule). My farm is open for National Farm Days in September each year, and on other weekends in conjunction with regional agricultural events. Visitors are able to see the alpacas and geese as well as guinea fowl and ducks. I am available by appointment only due to my farm market and event schedule.